Quivira, the newest luxury development in Los Cabos encompassing two resorts and three high-end real estate communities, has set Oct. 1, 2014 as the opening date of Quivira Golf Club. On a dramatic site at the tip of the Baja Peninsula marked by windswept dunes, sheer cliffs and desert foothills 10 minutes from downtown Cabo San Lucas, Jack Nicklaus has crafted a golf course that is poised to redefine the Cabo golf experience. The formal opening of the 7,224-yard, par-72 layout in October will mark a watershed moment in the history of golf development in Los Cabos, a destination revered for its consistently sunny weather and unique mountain-desert-ocean ecosystem. In addition to its stunning panoramas and breathtaking drops from tee to fairway, Quivira offers players more oceanfront exposure than any other course in Los Cabos. All 18 holes feature outstanding vistas of the Pacific and, in the winter months, views of breaching whales. 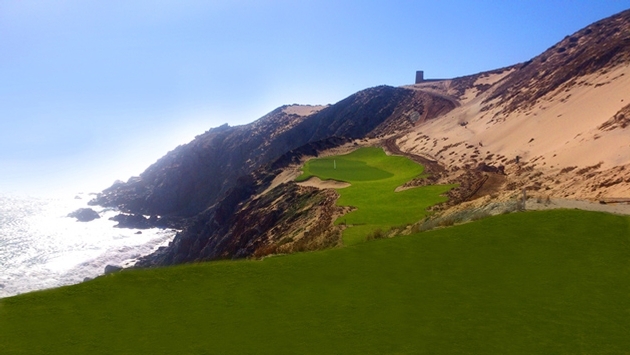 The $40 million golf facility at Quivira, more than eight years in the making, commences at sea level near the rolling surf before climbing to a highest point of more than 350 feet above sea level, where the views are a match for the challenge. During the round, players can refresh themselves at four comfort stations interspersed throughout the all-inclusive facility. A halfway house situated near the eighth green, called the “Oasis,” will showcase the culinary talents of the resort’s chefs, with tuna sliders, fish tacos and Mexican specialties available. Complementing the golf experience at Quivira Golf Club is a stylish, thatched-roof clubhouse between the first tee and 18th green that offers a large rectangular bar, a casual steakhouse and ample outdoor seating overlooking the sea. Beside the clubhouse is a spacious double-ended practice facility that parallels the ocean as well as an elongated practice putting green and an expanded short game practice area. Quivira Golf Club is accessible to guests of the four Pueblo Bonito Oceanfront Resorts and Spas in Los Cabos, and to owners of properties in Copala, Montecristo Estates Luxury Villas, and Novaispania Residences. Each of the Pueblo Bonito Resorts welcomes guests with lavish accommodations, unsurpassed service, fine dining and a host of on-site amenities. Complimentary shuttle service to and from Quivira Golf Club will be included within the Quivira development. For reservations or further information access the web site at www.pueblobonito.com or 1-800-990-8250.